This is the story of Fritz & Kamp, and they departure from suburban ranch for timeless architecture in the city. Honeymooning as classic home purists; they knew that in order to reinvent their love, starting anew in a dramatically different setting was paramount to living a fulfilled life. Steps to a cloverleaf-ramp, their Minnetonka mills mid century ranch was delightful and thoughtfully dialed. A desire for the greenspace walkability, and step-count steroid that Minneapolis' parks, lakes and creek circuit. 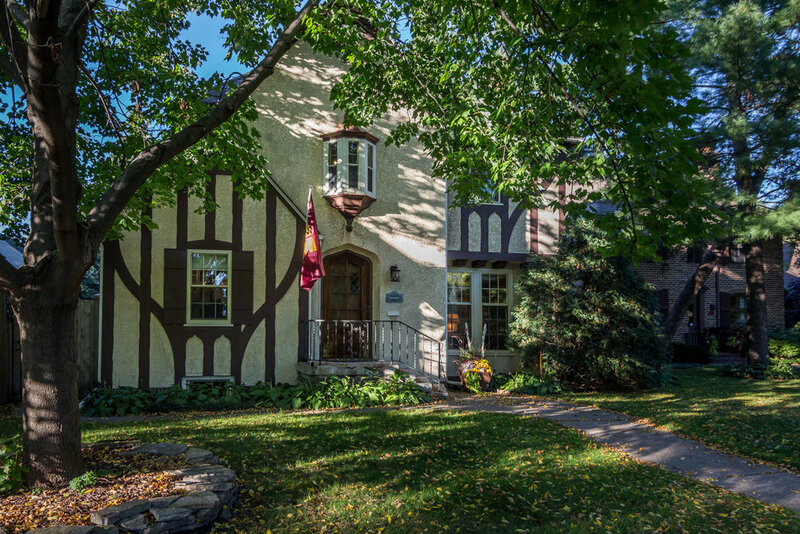 Complacency doesn't reside within these two; enter a 1931 Spanish Tudor Revival nestled south facing over Minnehaha Creek in Shenandoah Terrace. How does this happen? Vehicle reliant suburbanites, who finally have gotten their 50's rambler to an impressive and turn key status- time for wine trips and kicking back in the panel lined basement? NOPE! Not these beauties, you see, Fritz & Kamp wanted to return to period of classic architecture. Kamp grew up in Linden Hills and knew that Shenandoah Terrace was developed by the same craftsman that delivered our historic Country Club district. We're back some five years later, to check-in on their first chapter as stewards of this '31 capsule, rich with ownership history including ghosts, time capsules and enduring the flood of 2014. It was Kamp- that blonde spitfire on the right, that extended their search bubble along the creek east of 35w, within days of that bubble extension, they were meeting me in the recently "flipped" '31 tudor. Restoration isnt a flip, no matter what HGTV tells you. 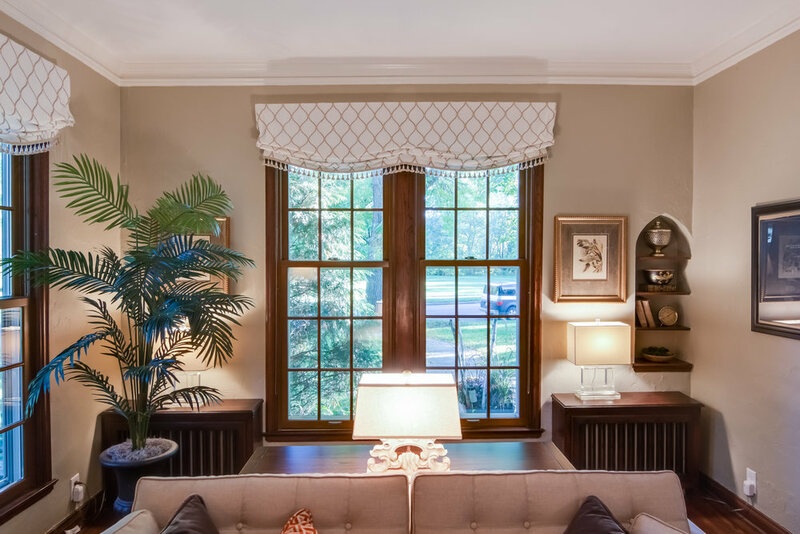 One thing a flipper will never endure: is the revitalization of the original arched door, which mimics the Spanish style archways throughout the home. The art deco tile was painted over in the guest bath which kills me. Undoing the open kitchen is first on our list- restoring the archways and dining built-ins. Faucets and fixtures are plastic and cheap, the throw away culture entering a classic home. A scent entered their garage in the first summer, one that couldn't be defeated, bleach wash after bleach wash its source was still a mystery. It was eventually found that a mouse/rodent infestation had been brewing for a decade above the garage ceiling and below the master bath. Regarding the ghosts, Maggie makes her presence known throughout the home on a regular basis. When asked on the downside of 1931: The parkway where we live is a thoroughfare, and we realized this after moving in, however you get used to the traffic and activity, we run and bike several times a week. Flood of 2014: Everyone knew it was coming, water shooting in through the walls in the midst of the night. Kayakers ventured the parkway- as water was deep enough to kayak the creek! Fish could be seen swimming through the park across the street. The fortitude and love in the neighborhood surfaced immediately during the flood, neighbors would be sandbagging each others lots, helping with bailing water and drying out basement rooms. The interior door was removed from the hinges and into Ben Imhoff's shop for a full strip, stain and a myriad of Marine grade varnish coats to ready it daily for the south facing sunlight.